Located in the heart of the Black Hills, Keystone is not only home to the world-famous Mount Rushmore National Memorial, it is also the gateway to the Wild West. From Western adventure to authentic Plains Indian Culture, South Dakota offers a truly unique Western experience for all visitors. Whether you opt to go spelunking through the hundreds of miles of cave systems in the Black Hills, do a little gambling at one of historic Deadwood’s many casinos, or explore the prehistoric remains of over 50 mammoths, you will leave South Dakota with a bag full of unique memories. Be sure to check out the Reptile Gardens with it’s impressive Galapagos Turtles, the breathtaking Jewel Cave National Monument near Custer, and the notorious Sturgis Bike Rally, held in August each year. Visit South Dakota’s numerous galleries, antique shops, village stores, restaurants and inns. The South Dakota lodging choices are big. Choose from South Dakota hotels, resorts, motels, motor inns, and destination lodges. Find the best South Dakota lodging deals by following the links below. 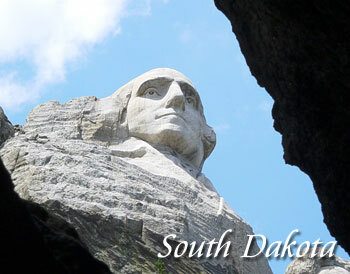 Contact us to add your South Dakota Lodging Property. Contact us to feature your South Dakota hotel or lodging property. Keystone, South Dakota is home to the famous Mount Rushmore. In South Dakota, vacation fun is reality. You’ll discover authentic, hands-on experiences that make your trip exceptional. Whether you’re into family fun, Western adventure, Plains Indian culture, or the extreme outdoors, South Dakota is a great vacation destination.